11 years ago my husband and I got married. We moved into an apartment and had a good first year of marriage, but we weren't happy with our living situation. We decided to buy a small starter home and couldn't wait to have our own yard and get our first dog. We decided on a sweet, energetic beagle puppy and named her Matilda. Fast forward 10 years and Matilda isn't a young puppy anymore. So we are slowly learning how different caring for an older dog really is. About 3 years ago we moved onto 10 acres of land and it was like Christmas for Matilda. She had room to roam, animals to chase and plenty of space to lounge in the sun. But those 3 years have also been hard on her. Her body is older and there are a lot more dangers in the country that she didn't encounter in the city. She has really loved being out here but it has also aged her quite a bit. We've been worried more than once that she might be nearing the end of her time but she has recovered and bounced back. Naturally, we want to ensure she has the best possible dog life. 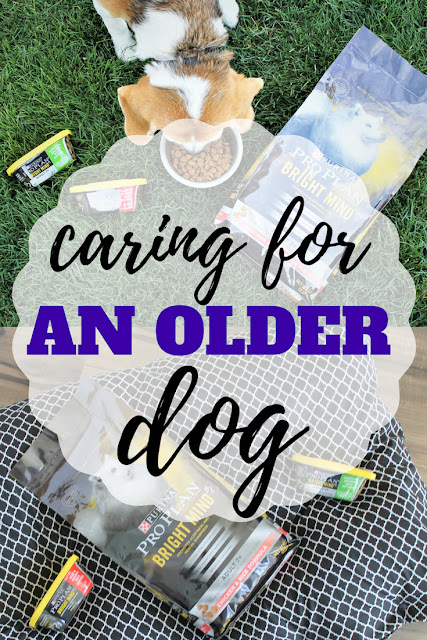 We have found some simple ways that we can make sure we are caring for her in her later years appropriately and that we are giving her the best life possible. We thought we'd share the top 5 ways of caring for an older dog. It is said all the time, but exercise is important, dogs need exercise. They need to go outside and run around. They want to go on a walk with you or explore the backyard. We are lucky enough to have 10 acres for Matilda to roam around and explore, but we still try to take time to play with her and walk with her, even if it is just around the property. It keeps her fit and healthy. Strong muscles, bones and heart is important for the healthy life of your pet. Nutrition is key in having a healthy older dog. 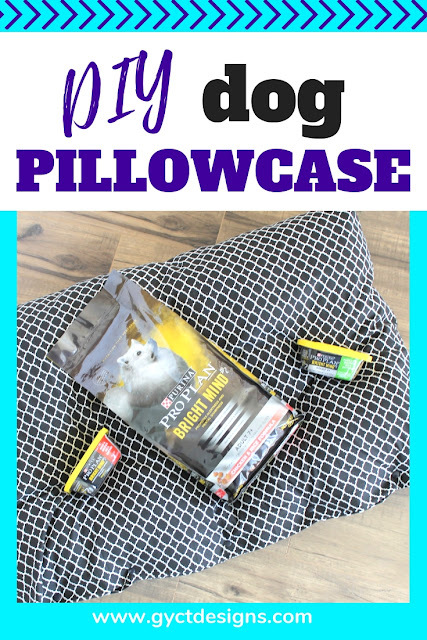 Finding products that really fit the needs of your dog is so essential but can sometimes be overwhelming. We've researched and tried many products and asked questions but can still get confused. 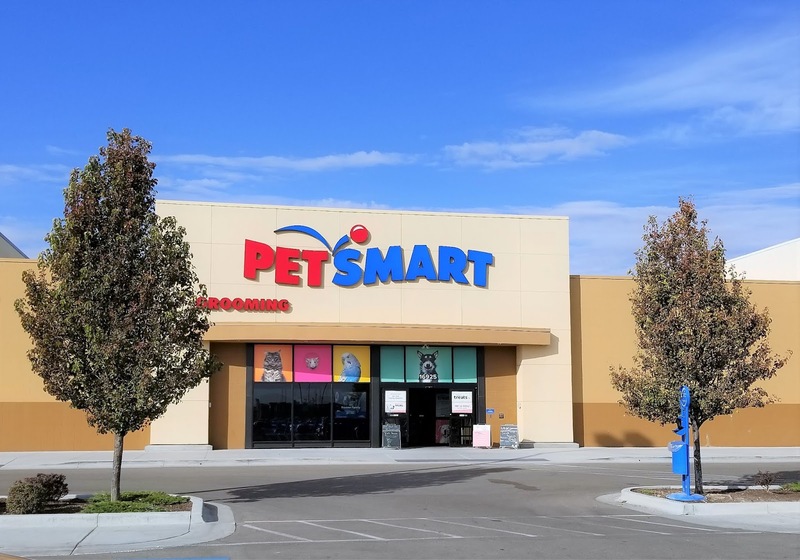 That's why we head to our local PetSmart when we need some advice or new food for our dog. The employees are cheerful and very welcoming. They are willing to help us find what we need and can answer our questions. Once in the dog food aisle, we found so many great options for both dry and wet dog food. In this trip we discovered the Purina® Pro Plan® Bright Mind® for adult dogs 7 years and older. 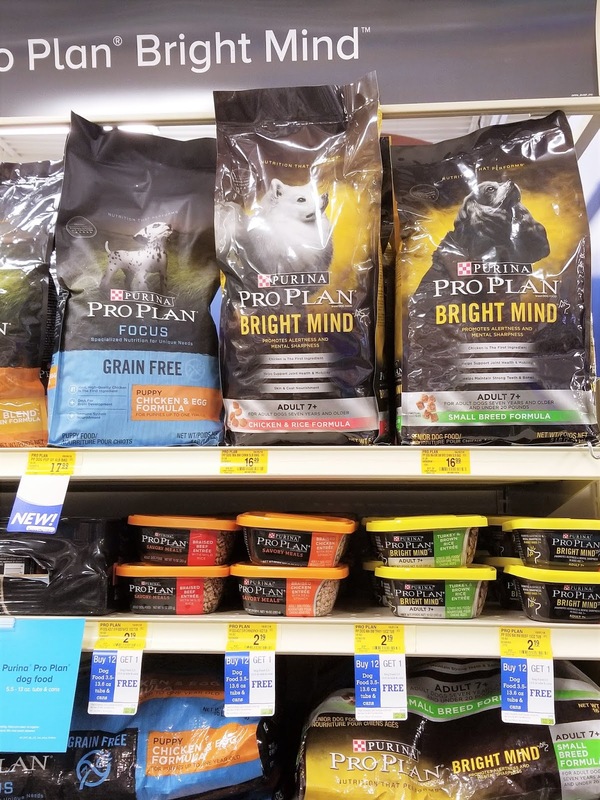 After a bit of research and talking to the PetSmart employee, we learned that not only is Purina® Pro Plan® Bright Mind® backed by 85+ years of Purina research but it is made with enhanced botanical oils shown to promote alertness and mental sharpness in dogs 7+. Which is exactly what we want! We want Matilda to have as much alertness and mental sharpness as she can for the years she is with us. Plus, we know we can trust Purina® Pro Plan® Bright Mind® because they've been fueling pets since 1986. That's a long time for a company to be researching, feeding and loving pets. Click the image above to shop the Purina® Pro Plan® Bright Mind® line of great products. We all want a nice and comfortable place to sleep. Dogs are no different. However, the challenge we've found with caring for our older dog is she doesn't always get outside to use the bathroom on time. So we end up cleaning a lot more messes than we have before. To help alleviate some of the mess and make cleaning up a breeze, I decided to make her some dog pillowcases. They are perfect for popping on and off her comfy dog bed. But they are also great for keeping her bed and our floor from the mess of incontinence. 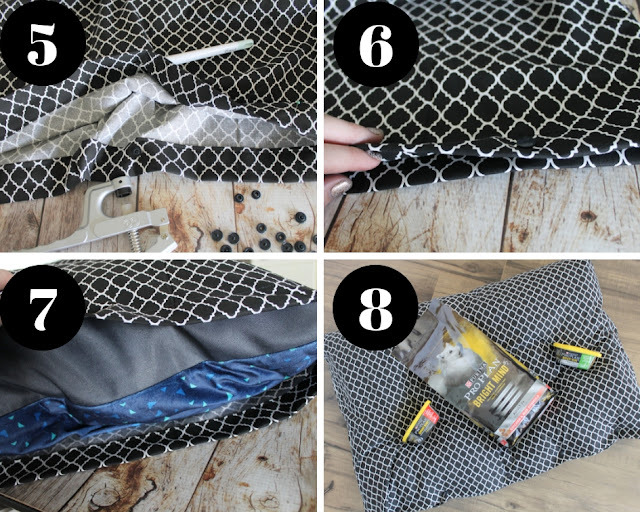 Let me share with you how quick and easy this project is. 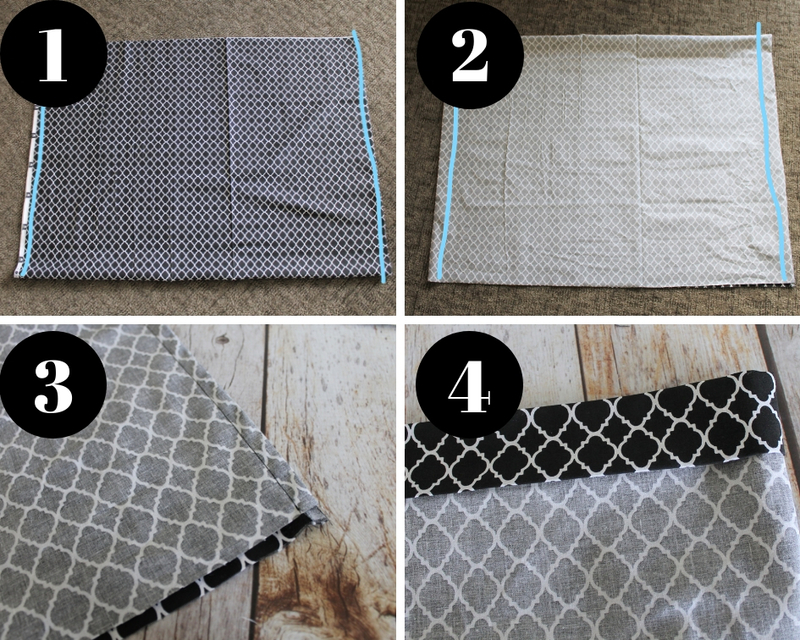 Start with a piece of fabric that is 2" wider than your pillow and 4" longer. Place the right sides together and stitch down the 2 short sides at 1/4" (1). Next, turn your pillowcase wrong side out and stitch again down those short sides at 1/2" this time (2). You've just sewn a french seam (3). Your raw edges are enclosed and are stronger now. Next, turn the open edge of the pillowcase 1/4" and than 2" (4). Stitch around the bottom edge of the fold. You'll want to add either KAM snaps or Velcro to the edge of your pillowcase (5). Measure about 4-5 inches in between each snap or piece of Velcro and place a new one (6). Once all your snaps have been added, place your pillow inside the pillowcase and snap it closed (7). Let your dog enjoy her new dog pillowcase (8). Helping your dog stay groomed is another great way to keep them healthy. Whether you take them to PetSmart to be groomed or you groom them yourself at home, taking time to clean and groom your dog will help them stay healthy and keep away ticks, fleas and other pests. We all love a little extra love and attention. Older dogs need this too. Matilda is no exception. She's gotten a lot of attention lately as my parents have moved in with us for a short time. They've loved on her, cuddled her and rubbed her belly so much. She's getting a bit spoiled. But we can tell how much she enjoys being acknowledged. Taking time to enjoy your older dog is important for their mental health as well. We are so grateful for have Matilda in our lives. Our family would not be the same without her. Making sure we care for and love her is important to us and our entire family. I hope us sharing the ways of caring for an older dog has helped you recognize how important your dog is to you. And don't forget to check out this great offer from Purina® Pro Plan® Bright Mind®.